Amin al-Husseini inspects SS troops. Sounds like something Osama bin Laden would urge, doesn't it? Actually, this quote was uttered long before bin Laden was even born, by Amin al-Husseini, (1895-1974) Grand Mufti of Jerusalem. The biography of Husseini reminds us that the term 'Islamofascism' is no mere neologism aimed at extreme Muslims in the wake of 9/11 - it is also a reminder of the Nazi roots of extreme Muslim anti-semitism that still rages today. "The Mufti was one of the initiators of the systematic extermination of European Jewry and had been a collaborator and adviser of Eichmann and Himmler in the execution of this plan... He was one of Eichmanns best friends and had constantly incited him to accelerate he extermination measures. I heard him say, accompanied by Eichmann, he had visited incognito the gas chambers of Auschwitz." Husseini recruited 21,000 Bosnian Muslims into the Scimitar division of the Waffen SS, which fought Marshal Tito's partisans in Yugoslavia. 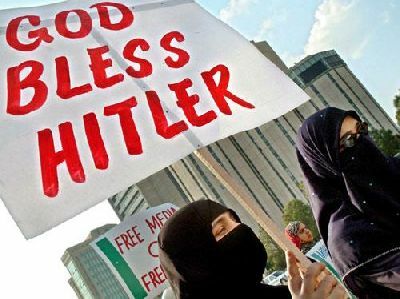 If you think Husseini learned his anti-semitism from Hitler, you might be surprised to know it might have been the other way around. As early as 1920 Husseini was organizing pogroms against Jews while 'Palestine' was still under British control, killing hundreds of Jews and injuring many more. "I was in our village for the summer vacation when Hitler marched from Munich to Berlin, to wipe out the consequences of Germany's defeat in World War I and rebuild his country. I gathered my friends and told them we ought to follow Hitler's example...."
One of the founders of Syrias Ba'ath Party, Sami al-Joundi, said "We admired the Nazis. We were immersed in reading Nazi literature and books . . . . We were the first who thought of a translation of Mein Kampf. Anyone who lived in Damascus at that time was witness to the Arab inclination toward Nazism." 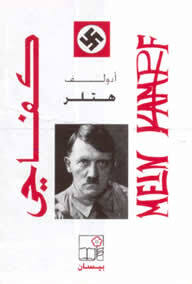 Gamal Abdel Nasser's brother Nassiri translated Mein Kampf into arabic, and was an enthusiastic supporter of Hitler. By the way, Yasser Arafat called Husseini a 'hero' - no surprise there, because Arafat's real name is Abd al-Rahman abd al-Bauf Arafat al-Qud al-Husseini. Arafat was the Grand Mufti's nephew and he changed his name to obscure this fact. The torch was passed from Husseini to the Father of Modern Terrorism, whose Fatah party is now considered much more moderate than Hamas! Is it any wonder that books like Mein Kampf (a bestseller in Turkey and Palestine) and the Protocols of the Elders of Zion enjoy brisk sales throughout the Arab and Muslim world? 'Hitler' has even become something of a popular name for Palestinian children, and admiration for Hitler runs deep among many Palestinians. Should it surprise us, then, to see pictures like this? eye opening and sad. wish more people knew this. This was something of an eye-opener for me too in researching it. I didn't know just how deep and widespread the cooperation with, and admiration for Adolph Hitler is among Arabs. They don't seem to be the least bit embarassed by it, either. we were allied with stalin in ww2. what's the difference? If the palestinains are so horrible why do the israelis want to live there? Lester, we were allied with Stalin precisely in order to defeat Nazism because it was such a huge threat. Churchill said he would have allied with the devil himself in order to defeat Hitler. And the Jews want to live in Israel because it is their home - what more do you want? Exactly. We weren't allied with Stalin in order to invite him to the next White House BBQ. don't foget lester, stalin was initially an ally with Hitler until hitler invaded. it posed a great opportunity for us to ally with stalin and put Germany on a 2 front war to exaust their supplies and troops. In the end it paid off for the U.S., but was sad news for poland and a lot of eastern europeans after countries were divided up and stalin gobbled up the majority ,sending them one course to a bottomless pit of unbelievable human suffering under communism. We were aligned with OBL in Afghanistan to fight the Russians. Helping someone fight your enemy does not make that person your friend. I am no supporter of Israel on religious grounds. Jew, Christian, Muslim. Does not matter. I support them in the mere fact that all people, regardless of race or heritage or religion, should be free to live in a society where they don't constantly have to fear being killed simply because of their religion, heritage or race. Israelis are simply people. Many are Jews, and maybe the land used to belong to the Muslims, but in the end, most are innocent folks who simply work, live, eat, sleep, and crap like the rest of us. They may go to Temple on Saturday instead of praying five times a day, but in the end, most were not even alive in 1948. But the Palestinians view Jews like the do Americans. Kill innocent women and children. Scorched earth policy. If you are a Jew or an American, you should be killed simply because of your heritage and association with the Great Satan. You commited no crime, but simply happened to be born a Jew or in America. So what makes this different between flying a Klan flag and killing blacks simply because they are black. Or maybe slavery. Or going into a gay bar and killing some homosexuals? Or bombing a Planned Parenthood clinic? Not a damned thing. Yet Liberals in this country condemn Israel for trying to get a 19 year old Army Corporal who was standing duty inside of his own country and did nothing wrong back from a pack of bloodthirsty killers and racists. And Israel is intentionally minimizing civilian casualties. Running ovens to exterminate people and bulldozing people into pits make Stalin and Hitler about as evil. So what was the right thing to do? Not align with Stalin to defeat Hitler? Take them both on at the same time? The point was the root of all of this. And it is hatred. Same root as for the Klan. Same root as Darfur. Same root as racism and gay bashing and so on and so on. These folks were collaborators. The Nazis and the Palestinians want to exterminate the Jews. After they push Israel into the sea, why not execute the gays and the blacks next? Ethnic cleansing should kill everyone that is undesirable. And the Nazis did. Islamofacism has to be recognized for what it is. And yet the UN keeps condemning Israel? That says all that needs to be said about the UN. As if Oil for Food or the Congo peacekeeping didn't already say it. Ken...That is a wonderful picture of Yasser Arafat!...My oh my. And poor Ringo Starr still has to go around with that face. Normally, Godwin's law applies to Hitler references. Here, it's history. Don't forget the "socialist" component of Naziism was also congenial to Nasser and the Ba'ath. Saddam is an admirer of both Hitler and Stalin. Jewish tradition traces is all back to Amalek, of course. Nothing new under the sun. Have an aversion to firearms? Get over it. Hitler was totally anti-communist. So why didn't we ally with him in WW2? Not that i would have wanted that. I'm just saying. you are condemning the mufti guy for being allied with Hitler, our allying with STALIN wasn't much better. lke you said "Helping someone fight your enemy does not make that person your friend." Have any of you ever read any palestinian perspectives on this issue? I'd recommend Henry Cattan's "the palestine question". He's a lawyer and he makes a strong case. or did, I think he died in the 60's. But he was in jeruselem pre-1948. just on the face of it, Israel is pretty ridiculous. I mean, it's a home for jews that is totally secualar and modern. How "jewish" can they be? I don't mean the people living in the kibbutzes and stuff, I mean Tel Aviv. Before the soveit union fell israel was disintegrating. alot of the people there now are russian jews. nothing against russain jews, but they aren't even semites. they converted around the time of charlemagne. Also, what do you think of the idea of one state for muslims and jews? I know south africa hasn't been a raging success post-apartheid but they are trying. and israel does resemble apartheid in some ways. I think that would be great. We are condemning the mufti guy because he is a psychopath, murderer and major proponent to the hate islamofacist have in their hearts. can you not see that? Hitler didn't hate communism for crying out loud, he loved karl marx. He hated Russians! he called them "the dirt people." And we didn't ally with Hitler, lester, because he was attacking our allies, you know France, Poland and England to name a few. The reason that lots of jews from Russia live in Isreal is because they were persecuted. And you don't have to be a semite to be a jew. where do you get this stuff. Besides, Communism hates religon, karl marx calls religon the "retardation of society." You need to read about the war of 1948 and why the arabs fled and then claimed to be refugees, too long to explain. but trust me, they are refugees by choice, nothing more. And to say Isreal was falling apart in the 90's is insane. It just is, that is rediculous. finally, Isreal is not secular in a sense that only judaism is permitted. Many christians and Muslims live in Isreal and have their own places of worship. It is muslim countries that usually ban other religons. Don't think so? Go find a synagogue in saudi arabia. This is the most concise and erudite essays connecting today’s terrorists to the past. It should inspire the West to validate and stand behind Israel even more. 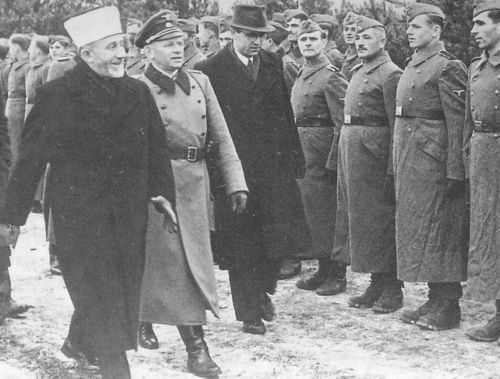 Arab Mohammedan's played a role in the Nazi Holocaust; it is no wonder that many deny its existence today. There is an ancestral connection and a plan to perpetuate the Holocaust today. Think on that as a Left minded MSM and Appeasement minded Liberals support Palestinian-Arabs for a Statehood they do not deserve. christian - I disagree in Mein Kampf Hitler states that his two biggest enemies are judaism and communism. He conflates the two wuite a bit and my guess is he was more anti-jew than anti-communist but that is what it says. I got that from the wikipedia description of mein kampf. I haven't read the book. As an interesting aside, Ion Mihai Pacepa (former head of Romainan Intellegence) said in an article in the Wall Street Journal that Arafat was a creation of the Russian KGB. Russia was behind Egypt in the 1960's and funding their borderline Communist agenda. Most of the Middle East was being funded by the Communists and many fo the states that we simply consider Dictatorships now, were heavily infiltrated by the Communist influence. While the ties to Hitler are there, the anti-Israeli ties are also to the Communists of Russia in the late 50's and 60's. Let's realize this for what it is--if Israel was aligned with the US and UK in the 1950's and 60's, it only made sense for the Russians to fund and equip Egypt, Syria, Iraq, Iran, etc. Russia had a vested interest in defeating Israel. Just like Afghanistan, it was a proxy fight against the Americans. If we continue to support Israel, we get another 9-11... Interesting premise. So what you are also saying is that if we stop supporting Israel, the Terrorists (and that means all of them not just OBL and Al Qaeda), will somehow be less effective against us? Maybe the entire Muslim world will stop hating us and we can all live in peace together? Wait, OBL will sign a peace treaty with us, right? Are you f*ing nuts? That is the stupidist thing I have ever heard. The only way to prevent another 9-11 is to continue to support any nation that fights terror. To align with nations committed to preventing terror. To strike at the core of terror. And terror as a means to win wars has been perfected by the Palestinians. You would rather support a terrorist like Arafat who engineered the hijacking of Airliners, than support Israel? Maybe you think we can be neutral, like Switzerland. Maybe just launder the money. .... But neither quote is in fact from Hitler. Both quotes were written by Friedrich Engels, Karl Marx's co-author (See here and here). So let that be an introduction to the idea that Hitler not only called himself a socialist but that he WAS in fact a socialist by the standards of his day. Ideas that are now condemned as Rightist were in Hitler's day perfectly normal ideas among Leftists. And if Friedrich Engels was not a Leftist, I do not know who would be. "Let us consider the actual, worldly Jew ....."
justinb - I disagree. Honestly, most of the muslims I know are pretty self absorbed. lol Like the shias mainly are intersted in lebanon, Shia Iraq and Iran. the rest of the world could fly away and they wouldn't notice. okay not exactly. I think they see israel as an invader, which it is, I mean it was only invented like 60 years ago and most of the people were from Europe. If we leave the middle east to the muslims we will save ourselves alot of headaches and $$. I don't see the possibility of them taking over america or europe or something. So in conclusion, tell me why we shouldn't just say "hey it's been real, bye bye" and never ever see them or be involved with them or hear the words "iraq" or "jihad" again? Bin laden called for jihad against america because we were on saudi soil, had sanctions on iraq, and supported Israel. Israel has like a 165 billion GDP last year. They don't NEED our support and they could probably defend themselves better without having to water down their defenses at our order. i think we can all agree they figh with one arm tied behind their back. As for the rest of the middle east I can't see why anyone would want to live there or go there much less be stationed there. Plus, we can't afford it, it doesn't make us safer and we really don't have the right to be there anyway. I just don't get why, if we know islam and the US are lke oil and water, we have to be in their face? it seems like an obvious contradiction. A timely post. I'm most of the way through Bernard Lewis's "Semites and Anti-Semites" which covers much of this history -- as well as the general manner in which European-style anti-semitism wended its way into Middle Eastern thought -- in a very readable manner. Recommended. Twice in three days, PA religious leaders have openly called for the genocide of Jews. Broadcast on official PA TV, both called for the murder of Jews until the Jewish people are annihilated. Both presented the killing of Jews not merely as the will of Allah, but also as a necessary stage in history that should be carried out now. To support these mandatory killings, both cited the same Hadith - Islamic tradition attributed to Mohammed - expressing Allah’s will that Muslims will kill Jews, before the “Hour” of Resurrection. 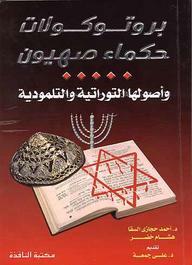 "The Hour [Resurrection] will not take place until the Muslims fight the Jews, and kill them. And the Jews will hide behind the rock and tree, and the rock and tree will say: oh Muslim, oh servant of Allah, this is a Jew behind me, come and kill him!" Numerous times in recent years Palestinian religious leaders and academics have taught publicly that this particular Hadith applies today. This teaching may well be a dominant motivating factor that drives terror against Israeli civilians, because it presents the killing of Jews as a religious obligation, not related to the conflict over borders, but as something inherent to Allah’s world. Again, you prove how ignorant those thinking we can have peace are. Destroying the Jews brings about the "Endgame" for the Muslim world, where Islam will rule the entire world and where blah blah blah. These folks are using Mohammed's own words to incite violence against the Jews and the non-believers as well as other Muslims. OBL wants to establish the Caliphate and have one world Muslim government that resembles the Taliban with its deep roots based on Shari'ah Law. He did not call for Jihad simply over us being on Saudi Soil, but over a desire to return to a government for the entire world based on Muslim beliefs. I like the strategy. It is called Pacifism or Appeasement. It usually works well too. Maybe if we just give the Muslims what they want and abandon Israel, they will stop all this fighting and live like happy little world citizens and we can have peace and harmony. I mean all people just want the fighting to stop and for America to live in Peace. No one hates America for any reason but our support of Israel. Oh, yeah, and Religion and the Koran have nothing to do with wanting to kill Jews and Christians and non-Muslims. From al-Qaeda's point of view, the political unity of the Muslim world was deliberately destroyed by a one-two punch. First, Western colonial powers invaded Muslim lands and detached them from the Ottoman Empire or other Muslim states. They ruled them brutally as colonies, reducing the people to little more than slaves serving the economic and political interests of the British, French, Russians, etc. France invaded Algeria in 1830. Great Britain took Egypt in 1882 and Iraq in 1917. Russia took the Emirate of Bukhara and other Central Asian territories in the 1860s and forward. Second, they formed these colonies into Western-style nation-states, often small and weak ones, so that the divisive effects of the colonial conquests have lasted. The Soviet invasion of Afghanistan was not an unprecedented event from the point of view of Bin Laden and his followers. Far from it. It was only the latest in a long series of Western predations in Muslim lands. The British had conquered Palestine, Jordan and Iraq, and had unilaterally opened Palestine to Jewish immigration, with the colonized Palestinians unable to object. The Russians had taken the Caucasus and Chechnya in the early nineteenth century, and had so brutally repressed the Muslims under their rule that they probably killed hundreds of thousands and expelled even more to the Ottoman Empire (now Turkey). From al-Qaeda's point of view, the Soviet attempt to absorb Afghanistan was the beginning of the end of the colonial venture. They demonstrated that even a superpower can be forced to withdraw from a Muslim land if sufficient guerrilla pressure is put on it. Bin Laden sees the Muslim world as continually invaded, divided and weakened by outside forces. Among these is the Americans in Saudi Arabia and the Israelis in geographical Palestine. He repeatedly complained about the occupation of the three holy cities, i.e., Mecca, Medina and Jerusalem. For al-Qaeda to succeed, it must overthrow the individual nation-states in the Middle East, most of them colonial creations, and unite them into a single, pan-Islamic state. But Ayman al-Zawahiri's organization, al-Jihad al-Islami, had tried very hard to overthrow the Egyptian state, and was always checked. Al-Zawahiri thought it was because of U.S. backing for Egypt. They believed that the U.S. also keeps Israel dominant in the Levant, and backs Saudi Arabia's royal family. Al-Zawahiri then hit upon the idea of attacking the "far enemy" first. That is, since the United States was propping up the governments of Egypt, Israel, Jordan, Saudi Arabia, etc., all of which al-Qaeda wanted to overthrow so as to meld them into a single, Islamic super-state, then it would hit the United States first. You think this is simply about Israel? No, it is about overthrowing the entire Middle East. Israel is only part of it. OBL was not just pissed at the US for being on Saudi soil, but the fact that it was the Saudi Royal Family that invited us there. Notice that before Al Zarqawi came to Iraq, he had been trying to overthrow the Jordanian government for years and spent several years in prison. Ayman al-Zawahiri had been trying to overthrow the Egyption government. Neither of these have a hell of a lot to do with Israel, now do they? What about OBL? Well, he was expelled from Saudi Arabia for trying to overthrow the Saudi government. He succeeded in establishing the Taliban in Afghanistan and was using Afghanistan as the base to launch the overthrow of every government in the Middle East. So what happens if we just surrender and stop supporting these Middle Eastern governments? Well, Islamic Radicals like the Mullahs in Iran will overthrow every government in the region and then unite them to destroy Israel and the rest of the world and force Islam on all of us. Do you think genocide against the Jews started in the 1940s? Oh, religious tension between Christians, Muslims, and Jews did though. And Islamic Fundamentalists have never tangled with India and the Hindus either? Nah, this is all about Israel isn't it? Ah, but Shari'ah Law is a good thing for the women of the world. Like when they stone women to death for adultery when they are raped. Or maybe when they burn every liquor store and kill anyone who protests. Or cut off the hands of people stealing. That is the Shari'ah Law that ruled Afghanistan, Fallujah, and the other attempted Caliphate states that Al Qaeda has set up. Maybe we should just submit to Shari'ah Law like they are doing in Canada and Germany. Premier Dalton McGuinty said today Ontario will reject the use of Shariah law and will move to prohibit all religious-based tribunals to settle family disputes such as divorce. His announcement comes after hundreds of demonstrators around the world this week protested a proposal to let Ontario residents use Islamic law for settling family disputes. Maybe they can order Gang Rapes for the family members of men accused of walking with more prominent families. Or beheadings. Maybe 20 lashes for drinking alcohol. Or cut off hands for stealing. Good ol' Canada. They thought this might actually be a good idea. Stalin was a realist, Hitler was an adventurer. I mean it was only invented like 60 years ago and most of the people were from Europe. And when were Jordan, Saudi Arabia, the Gulf States, Lebanon, Syria created/(carved out of the ex-Turkish Ottoman Empire)? Egypt was given control of Sinai after the First World War, during the 20s. As for the Jews; what about those who had lived for centuries in Safed, Hebron and Jerusalem, for starters. As for Honestly, most of the muslims I know are pretty self absorbed. Then you don't know very many. I don't believe you are real Lester. I think your either an anti-semite pretending to be pragmatic, or an idiot. Yes it's blunt and personal but sometimes that's what is called for and your provide lots of evidence for such a conlcusion. The way you gloss over important points like the motivation of the Arabs alliance with Hitler (they had a common belief) vs. that of the US with Stalin (we had a common enemy) for example. "just letting the jews fend for themselves" condemns millions of people to murder. Yes stopping something like genocide is worth it and some might say a civilized nations duty. No Israel was not founded 60 years ago. Re-established by the U.N. after being colonized by the British yes. Palestine however was founded for the first time after world war 1. Can you provide any evidence of a Palestinian language, currency, or other indicator of a nation? No you can not as it never was a nation. It was always part of some other country. Jordon, Egypt, Israel, The UK. It was never it's own country. Israel was. Often conquered, often ruled by outsiders no doubt, but also its own nation with a history going back thousands of years. ugly american- It doesn't matter what the land was called. the people who lived in what is now israel when the original zionists came had been there for a long time. The Syrian people did not come from italy in like 1750 and are now "syrians" like the european semites did with Israel. Certainly many of the european jews had ancestry that goes back to the area of israel. But that was 2 thousand years ago in some cases. and the 'palestinians" were ALSO there then. justin - I would not interpret al quedas attempt at overthrowing the largely corrupt monarchies in the middle east as imperialist or that they are going to move on to europe and america. If so, we'll cross that bridge when we get to it. Al queda's general point of view is a more violent version of what pretty much all middle eastern people feel: that the US supports corrupt dictatorships lke the saudis and that they are complicit in the israeli occupation of the west bank and gaza, they are absoultely correct in both cases whether you think that doing so is right or wrong.
. The Syrian people did not come from italy in like 1750 and are now "syrians" like the european semites did with Israel. Actually the Turks brought into the region many "conversos" from what is now Bosnia, Montenegro etc. The Brits brought in Syrians and Egyptians to do the heavy lifting after the First World War and then when those Jews who had planted themselves in the late 19th century, after fleeing Russian pogroms, started producing many others came to take advantage of the economical advantages. It would help if you read how the British perverted their League of Nations Mandate for Palestine. So you accept that Israel was the Jewish homeland like 2000 years ago. Under that premise, you recognize that being the "former" residents of an area that was taken from you does not entitle you to specific rights to re-occupy that area. People are displaced by wars all the time and they are not offered the right to return and reclaim their lands. So f- the Jews where were displaced. The new occupants took the places and it does not make sense to re-establish ownership because no property records exist from the 0 AD range. Well, guess what, same goes for the "Palestians". The West Bank, Gaza, etc., were rightfully taken when the former owners (Lebanon, Egypt, etc.) decided they wanted to go to war with Israel. You lose a war and you lose your rights of ownership. It is unfair, but who ever said war was fair. So now what we are talking about is how long do you have to vacate your lands before the new owners can hold title to them? Is it 2000 years or 200 years or 20 years? I know that the Brits established the Jewish state in the middle of last century. They owned the land and they ruled it. They had that right. And the "Palestinians" were probably the victims of the British Empire and its control over most of the world. But the Jews were the victims of the Roman Empire. It is unfair to lose your land and homes, but life is unfair. And as long as the Jews are there, it is our responsibility to support the decisions of the British Empire to allow them to be. Part of the establishment of Israel was due to our allowing the Nazi extermination of the Jews and "white man's guilt" over our role. Did we make a mistake in establishing Israel? Perhaps, but it would only be compounded by taking what amounts to Israeli land that was given to them in the 1940's and 1950's. We could have given the Jews Germany and that would have been fair. Or Poland. We have an obligation to defend Israel, just as we do to defend Darfur and Rawanda and Somalia and Bosnia. Genocide is genocide. And what the Palestinians want is Genocide. What the Islamic world wants is Genocide. The Israelis have tried peace treaties and abandoned Gaza just a year ago and yet the rockets never stop coming and the PA allowed Hamas's militant wing to take the Israeli soldier as a prisoner. So fair is fair. Just like the Six Day War was fair. One sided, but fair. Throughout history, land was possessed by those that were strong enough to hold it so it hardly matters who used to reside on the land. If that mattered, all of central Europe should be deeded back to the Celtics that resided there until the Germanic tribes pushed them out, and you know who used to occupy all the lands of North and South America. In the mid-east where Palestine and Israel are currently, there was the Canaanite tribes, Philistines (Gaza ares), Phoenicians (Lebonon area) and the rest of the mid-east area were dominated at different times by the Egytians, Assyrians, Chaldaeans (Babylon), Persians, Greeks and Romans. None of this really has much to do with our support of Israel. Currently, Israel is our only dependable ally in an area, the mid-east, that is seething with radical Islam which wants to conquer the world. We really can't afford to see Israel defeated. "We have an obligation to defend Israel, just as we do to defend Darfur and Rawanda and Somalia and Bosnia. " we have no such obligation to get involved in the affairs of these countries. The rwandan genocide did not occur for no reason. the two peoples had a history of hatred. If we could have had a military intervention with an exit strategy that would ahve been for the best, obviously. I really don't think somalia, bosnia, or darfur are any of our business. but that's me. say the pilgrims came to america and there were 300 million indians. Say they were not quite but almost as advanced as the pilgrims in many ways and had an effecctive form of mass communication. obviously this couldn't have existed in 1620, but my point is had this been the case there never would have been an america. we took the land from the indians because we could and maintain it because we can. I don't think indians are gonna make enough from their casinos to take regain the US. Middle east is different. israel can't overpower anyone without our help and military expertise. and with it, it's all muscle and constant vigilence. Are we gonna stop China from taking over taiwan? have a naval battle with China? No. We can only help so much I say. If interferring in the middle east leaves us open to terror than for the sake of our children we should not interfere in their affairs. Would it be so bad for israel to go back to their actual borders or , god forbid, live amongst the arabs and impart their knowledge to them as herzl claimed they would over a hundred years ago? The rwandan genocide did not occur for no reason. the two peoples had a history of hatred. If we could have had a military intervention with an exit strategy that would ahve been for the best, obviously. I really don't think somalia, bosnia, or darfur are any of our business. but that's me. Then why are we members of the United Nations? It seems to me that the actios in Somalia, Bosnia, Rawanda, Darfur, etc., were all bought on by UN Resolutions and it just happens that when it comes to the UN, we have to do all of the heavy lifting since we are the lone remaining superpower. Without our help, the UN would be the League of Nations and powerless. Not that it is much better, but why have a UN if not to prevent genocide? If interferring in the middle east leaves us open to terror than for the sake of our children we should not interfere in their affairs. No, we are viewed as Imperialists not because of our military or our helping Israel, but rather, we are cultural Imperialists. Think about our Imperial Power as compared to Great Brittain. Travel around the globe and try to eat. You see McDonalds everywhere. Buy a CD. Little local music, but American CD's and Magazines and DVD's and Computers. American Corporations are the Imperialists. It is the infringement of American Culture on the world that is why they hate us. They have societies where women are subserviant. And we come in and teach women to read and to vote. They have societies where they stone to death adulterers. They have societies that have operated for centuries and millenia without partial birth abortion or Amnesty International or new Christian Missionaries from the US trying to change their traditions and culture and mores. They have good reason to hate us. Far more reasons than simply Israel. And the only way that our corporations and diplomats and missionaries and governments will leave their lands is if they force us out. That is why they blow up Marine Barracks in Beirut and attack embassies and the USS Cole and our oil workers in Saudi Arabia. It is not over Israel. They could give two shits about Israel. They hate Americans. We are crass and believe we are the elite of the world. We spend American Dollars on trinkets and beads that amount to more than most of the world makes in a month. We spread our ideals and money and womens suffrage to a world that does not want it. I do not argue that these are bad things. I believe that American Corporations and America's ideals are the envy of the world. I believe that we have done many things that are wrong and not in keeping with those ideals, but at the end of the day, America is at the top because our people represent the best and brightest from around the world, united in the pursuit of liberty and freedom as well as property and wealth. We are many things and the world does not hate an enlightened Liberal new-age American any less than it hates a Cowboy Redneck from Texas. If it says American on our passport, we are American. And it has not a damned thing to do with Israel. Read more of the Liberal Anti-Corporation books and you will realize that Cindy Sheehan and Michael Moore need to refine their argument from Roger and Me and stop all the Jew hating. I like hating American Corporations more than hating our support for Israel, but it does not help the anti-war effort as much or support the cut and run position as well. justin- I see you are not a member of the "realist" school of foreign policy thought. You mean the cut and run or the duck and cover school of pacifism and retreat that we tried in the 1920's and 1930's? The term "McDonaldization" was originally coined by George Ritzer, Professor of Sociology at the University of Maryland and author of the book The McDonaldization of Society - An Investigation into the Changing Character of Contemporary Social Life. Ritzer defined McDonaldization as "...the process by which the principles of the fast-food restaurant are coming to dominate more and more sectors of American society as well as the rest of the world." Although there are some benefits of McDonaldization, in general, this process, in my opinion, can overall be viewed as harmful to our society. In fact, Ritzer calls the McDonaldized society a system of "iron cages" in which all institutions come to be dominated by the same principle. Now, the same phrase is being applied to Walmart. Don't think Walmart and McDonalds are part of why the world hates us? Well, most Liberal Elitist do and have been writing about it for far longer than since 9-11.